A Rhynie chert sample of 0.28kg found in 2003 has successively provided rare and surprising details. A conspicuous one is a large moult part of the crustacean Castracollis (Fig.1), now less rare than at the time when it was first described  and named after the farm Castlehill near Rhynie. 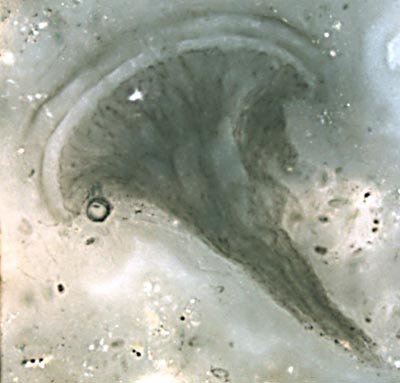 There is fossil evidence indicating that it might have grazed on tufts of the filamentous cyanobacterium Croftalania. Fig.1: Castracollis moult part without head and shield, 28 segments seen, numerous legs below. Image width 3.8mm. Less conspicuous but nevertheless highly significant are the spirals of a new variety of Nematoplexus, discovered in 2009, twice as large as those of the type specimen first described in 1961. As another surprise, a quite uncommon and probably phylogenetically important charophyte alga discovered in 2015 has been found shortly afterwards in this sample, too. In 2016, the series of peculiarities has been continued with an object which might be a detached compound eye (Figs.2,3). 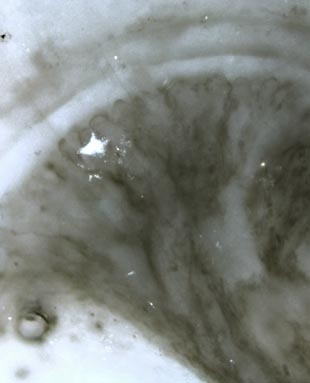 In view of the several Castracollis moult parts in this sample, one may conclude that it is a Castracollis eye, provided that it is an eye at all. If so, this would be the first image of such eye. Despite of the slightly disarranged state, the top ends of the individual components are still visible in Fig.3. Figs.2,3: Compound eye (?) of Castracollis, detached. Height of Fig.2: 0.3mm.